Education: BFA fine arts Columbus College of Art and Design. Favorite Credits: I sell the dead, stake land, Big Big World Chappell's show. David Bowie's unseen video. Why theater? : Theater is our most primal experience. It only lives once. No rewind. No delete. No undo. Tell us about The Flatiron Hex: Inspired by speculative fiction and neo-noir, The Flatiron Hex is a peek inside a parallel world infected with intelligent viruses and paranoia. 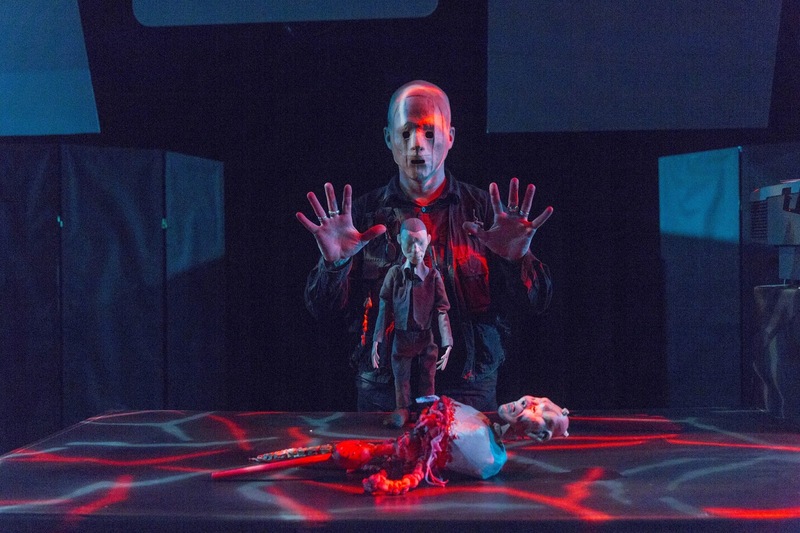 Set in NYORG, a city in the middle of a swamp, and told through puppets, The Flatiron Hex is the story of Wylie Walker, a contract shaman, who uses his unusual talents to troubleshoot and maintain NYORG’s interweb biotechnology. What inspired you to write The Flatiron Hex? : I was inspired by the faculty of of the Eugene O'Neill Theater Center, and the singular experience that can be found there. I was also insipired by the events following hurricane Sandy and the mythic as well as political implications of the flood. What kind of theater speaks to you? What or who inspires you as an artist? : The Encounter blew me away. I am a forever fan of Bill Irwin, Mimi Goese, Dancenoise. If you could work with anyone you’ve yet to work with, who would it be? : Irwin, Goese, Dancenoise, and Neil Patrick Harris. Who would play you in a movie about yourself and what would it be called? : I would play myself in a documentary about The Flatiron Hex. If you could go back in time and see any play or musical you missed, what would it be? : Fosse's Chicago invited dress rehearsal. What’s your biggest guilty pleasure? : Guilt is a social norm. Okay, "Law and Order". If you weren’t working in theater, you would be _____? : Plastic Surgeon. Go-go dancer. Fitness personality. What’s up next? : More The Flatiron Hex.